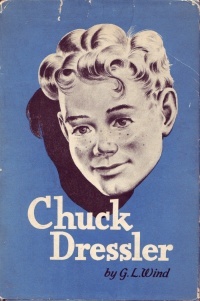 The engaging, freckle-faced lad who smiles at you from these pages is Chuck Dressler - the boy with the clever hands and true heart. His home is in Sunny Valley, a small town in the great Middle West. Perhaps you have seen him in your town or in your city block. In his boyhood Chuck rides the colt Wild Willy, to the admiration of his youthful friends. In his young manhood he rides a plane over China, as an Army pilot, and his fellow townsmen pay him tribute. Wherever Chuck goes, his active Christian faith is blessing to many. Ten half-page and four full-page realistic drawings for this exciting story were done by Phil Davis. This page was last edited on 7 February 2016, at 11:36.